Regular care for children is extremely important for setting a great foundation for a lifetime of good oral hygiene and a healthy smile. At Dentist Solana Beach, we provide dental care for the entire family, including infants, children and adolescents. Dr. Jessy Sidhu is experienced in providing dental care for infants and children and strives to make these special patients feel comfortable during their examinations and treatments. Your child should have his or her first dental appointment after the first tooth appears and before his or her first birthday. While children do lose their “baby” teeth, or primary teeth, these teeth are instrumental in helping children speak and chew properly. Additionally, these primary teeth create a path for their permanent adult teeth to follow when they erupt. Dental check-ups are also important opportunities to create a good foundation for ongoing oral hygiene and give parents the chance to ask any questions they have about a child’s oral health. In addition to regular examinations and cleanings, Dr. Sidhu may recommend further services to protect your child’s oral health. Other services provided in our Solana Beach office include sealants, fluoride, and mouth guards. Sealants are a clear or white flowable resin material designed to flow into and seal the deep grooves on the top of children’s teeth to prevent invasion by bacteria into these hard to clean areas. They are inexpensive, painless, and easy to place without shots or anesthesia. Sealants are proven to reduce cavities in children and adolescents by up to 70%. Make an appointment with Dr. Jessy Sidhu to discuss the benefits of applying sealants to your teeth. Fluoride treatments are also essential to preventing tooth decay for both children and adults and are part of a regular dental examination and cleaning. Mouth guards, “night guards,” or athletic guards, may be recommended for children that constantly grind their teeth at night, clench their jaws, or are active in sports. Mouth guards can protect the teeth from excessive wear and tear and can prevent severe dental trauma for kids that are highly active or athletic. 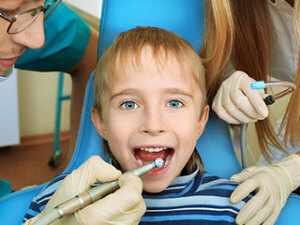 At Dentist Solana Beach, we provide restorative dental services for children in addition to preventative care. Children can suffer cavities, broken teeth, or malformed teeth just like adults. Our Solana Beach dentist and team are trained to provide restorative care to meet the specific needs of children. Call us today at (858) 481-7155 or request an appointment online for your examination and cleaning.